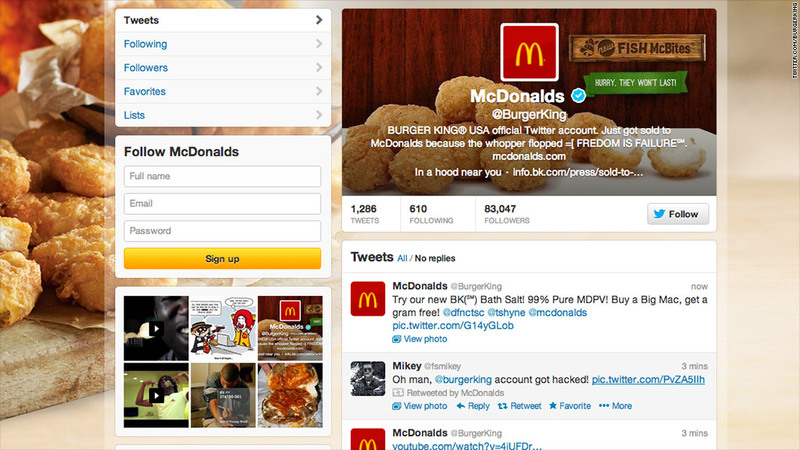 Burger King's Twitter account was hacked by an apparent fan of McDonald's. Burger King's management is just not having it their way lately. Two weeks after traces of horse meat were found in beef patties at a European Burger King (BKW) supplier, the burger chain's Twitter account was hacked. Making matters worse, the yet-to-be-identified hackers made it appear as though Burger King was bought by McDonald's (MCD). "We just got sold to McDonalds! Look for McDonalds in a hood near you," the company tweeted at noon ET Monday. Burger King's Twitter profile photo was changed to a McDonald's logo, and its profile information said, "Just got sold to McDonalds because the whopper flopped." It also included the misspelled line "FREDOM IS FAILURE" and a dead link to a press release. Over the course of an hour after it had been hacked, the account's attacker tweeted out a slew of increasingly ridiculous or obscene items. Twitter suspended the account around 1 p.m. ET. "The Twitter account of the Burger King brand has been hacked," said Bryson Thornton, spokesman for Burger King, who apologized for the incident. "We have worked directly with administrators to suspend the account until we are able to reestablish our legitimate site and authentic postings." A spokesman for Twitter said the company doesn't comment on individual accounts for privacy and security reasons, but he "urged users to use good password hygiene on Twitter." McDonald's on Monday tweeted, "We empathize with our @BurgerKing counterparts. Rest assured, we had nothing to do with the hacking." "Somebody needs to tell Burgerking that 'whopper123' isn't a secure password," tweeted @flibblesan. The hacker, using the @BurgerKing twitter account, denied the password was related to the Whopper, Burger King's iconic burger. The company's account included a mention of @DFNCTSC in its first message after it was hacked. It's unclear if that is the account's attacker, since no one has tweeted from that account yet. But the attacker appears to be a fan of hacktivist group Anonymous, using Burger King's account to ask the group to follow it. "We're guessing the @BurgerKing social media team is having a bad day..." tweeted @YourAnonNews, one of Anonymous' most active Twitter accounts. The hacked account did not mention anything about the horse meat scandal, though it did tweet out a gross-looking photo of a burger, saying "This is why we were sold to @McDonalds." On Jan 31, Burger King announced that it had terminated its relationship with supplier Silvercrest Foods after finding traces of horse meat in beef patties at a Silvercrest facility. Silvercrest provided beef for Burger King restaurants in the United Kingdom, Ireland and Denmark. Burger King said that while samples of beef from restaurants in these countries showed no evidence of contamination, four samples from a Silvercrest plant in Ireland showed "very small trace levels of equine DNA." Burger King said the tainted product was never sold in restaurants, and appeared to have originated from a sub-contracted supplier in Poland.